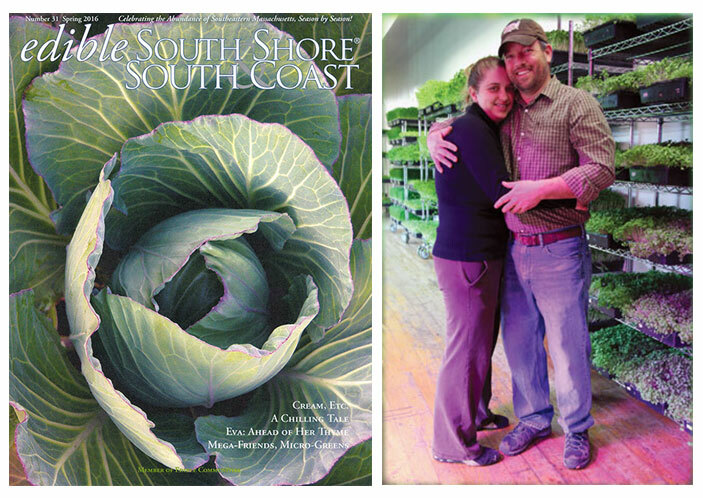 We were featured in the Spring edition of the edible South Shore South Coast magazine. Read more about the article below. Meet two local people. Unknown to each other, both are seeking a life and career change, and both are striving for a healthier lifestyle. Each is told by mutual friends that they really should talk to one another. Finally, when they meet, they bond instantly. The two quickly decide they need to do something together, but they aren’t sure what that something is. They do agree, however, that their new project needs to incorporate the three things most important to them: food, organics, and community. So these two new friends start a farm, and not just any farm, an organic farm inside an old mill building. Meet Ashley Driscoll and John Irving, the founding friends of 2 Friends Farm in Attleboro, and two kindred spirits who are blazing a trail of innovation. In 2013, Ashley and John planted 12 trays of ‘microgreens’ as a start, and now find themselves at the hub of a local microgreens revolution. In place of the rolling hills of a typical New England farm, 2 Friends features rolling trays of microgreens, with over 1,000 per week in production! “Business has grown over 500% this year alone,” John said. “And we don’t have to rely on the weather, we control the environment,” Ashley adds. ‘Microgreen’ is the universal name for almost any green vegetable or herb that has edible leaves and is harvested when the first set of true leaves sprout, usually within two weeks of poking their little green heads out of the soil. These microgreens are nutrient dense, containing many more nutrients, vitamins, and minerals than their fully-grown counterparts. They can complement dishes like salads, sandwiches or soups, or be eaten on their own. Once harvested at 2 Friends Farm—very carefully by hand—’micro-harvesters’ package the greens on site to ensure maximum freshness and safety. Their benefits and wonderful flavor are enjoyed all over New England in restaurants, cafés, grocery stores, and juice bars. The old mill building the farm resides in isn’t the only throwback for the farm. 2 Friends Farm stresses the importance of growing things the old fashioned way: organically. Pallets of soil lie at the ready for the next round of seeds, and while most microgreen growers use hydroponics (a process where seeds are placed directly onto cotton pads in water, artificially supplying them with the nutrients they need to grow), 2 Friends’ microgreens and wheatgrasses are grown the traditional way, with top quality seeds sown into rich organic soil, providing all the nutrients necessary for the plants to thrive. 2 Friends Farm believes that this approach will provide people with the freshest, tastiest, and most nutrient dense microgreens and wheatgrass possible. “And we compost all that microgreen super soil as well,” John boasted.. Using organic or non-GMO seed is simply common sense. Eating pesticides, meant to kill insects by attacking their nervous system (in most cases), is not safe for human consumption in my opinion. When a seed has its DNA genetically modified it is no longer the same life form, and our bodies may not know how to properly process it,” John added. 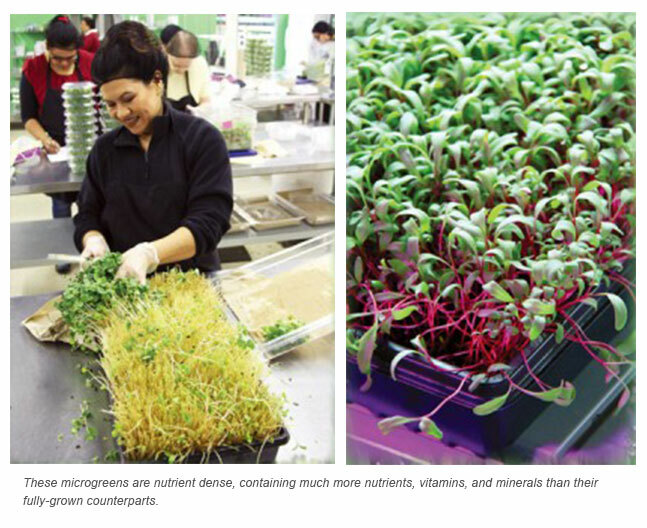 Microgreens are also considered Biogenic or ‘life generating’. They emit the highest degree of life-generating energy or lifeforce. Foods in this state are considered to be strong antioxidants. Vitamins A, C, and E all increase in volume in this state, some as much as 600%. Biogenics is the term used by the late Dr. Edmond Bordeaux Szekely, who hypothesized that eating food which strengthens and purifies our bodies on the physical, mental, and spiritual level helps us to retard old age, achieve higher intelligence, more easily adapt to heat and cold, reduce pain, and gain greater freedom from illness. That’s quite a punch from such a little green. 2 Friends Farm is flourishing, taking over more and more space in their old mill building. 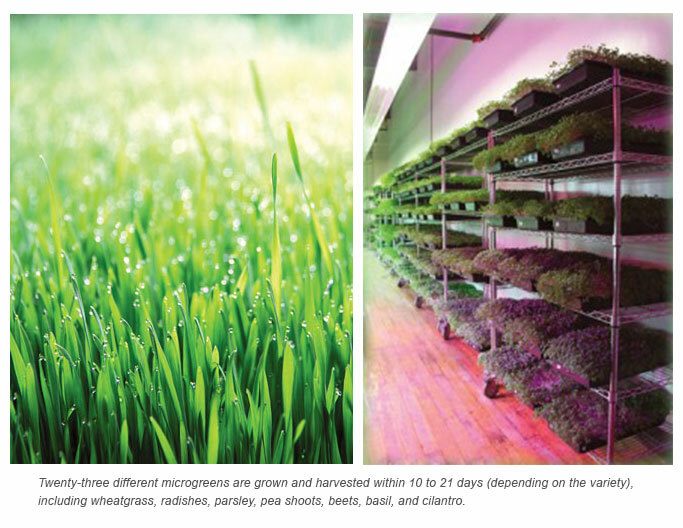 Twenty-three different microgreens are grown and harvested within 10 to 21 days (depending on the variety), including wheatgrass, radishes, parsley, pea shoots, beets, basil, and cilantro. John currently is using his background in contracting to design and build a self-watering system for the expanding space. “Watering takes a long time, especially indoors,” said John, but his system will use less water and be more efficient, and because of this, they were able to grant funding through MDAR (The Massachusetts Department of Agricultural Resources). As business grows, so do local job opportunities at 2 Friends. “We’ve created twenty jobs right here in Attleboro!” exclaimed John. They have hired high school kids, as well as moms, who need flexible work schedules. The space is clean and the atmosphere vibrant, the staff seem to feed off the wonderful energy of the crop. “If microgreens were a person, that person would be young, vibrant, ready for life, with a positive mental attitude,” said Ashley. With too many fast food choices in their area, John and Ashley hope to start their own restaurant someday, where customers can sample all their delicious crops on site, “Right now we’re so busy, that’ll have to wait, but that’s our goal for sure,” says John. Until then, you can find 2 Friends microgreens, wheatgrass, super salads, and mixes at markets all over New England, including The Alternative Market in North Attleboro, Lee’s Market in Westport, Pinehills Market in Plymouth, Foodies in Duxbury, and Fruit Center Marketplace in Hingham. Their microgreens also are being juiced from Worcester to Cape Cod at places like The Daily Press Juice Bar in Cohasset, The Juice Barn in Norwell, and served in fine restaurants like Davio’s in Boston, and Tavalo in Dorchester. 2 Friends Farm also recently started their “Fresh 2 You” delivery service. If you can’t find a local market, call them and they’ll bring the farm to you! Another way two friends and 2 Friends Farm are spreading the microgreens revolution. Organic, locally grown microgreens and wheatgrass, delivered to your home.